The tubing used for this frame is all pretty heavy walled True Temper steel tubing. Living in San Luis Obispo at the time, I was lucky enough to have a few experienced frame building friends who told me that the first few bikes wouldn’t really be worth riding, so don’t sweat using the sweet tubing. Make your mistakes cheaply. I was also building my own fixtures, so nothing was handed to me. The tubes were stuck together by fillet brazing. That method has always appealed to me for the beauty and the simple punk rock/cave-man seeming approach. I also had experience with an oxy-acetelyne torch as a jeweler and silversmith in school. In keeping with the cheap theme, it’s never been painted. Before I rode it I didn’t want to waste any money polishing a potential turd. As it turns out, this bike may have more miles on it than just about any other bike I’ve built for myself. It’s been a solid bike, in many guises, going on a lot of adventures. It’s been mountain biked, ‘cross raced, toured upon, ridden a ton on the beach at low tide, and spent five years as an everyday commuter with mostly the same basic parts originally put on it. It’s got an Isis bb that is eight years old! I try not to look at it too hard for fear that it may catch fire or something. That BB is an outlier, for sure. 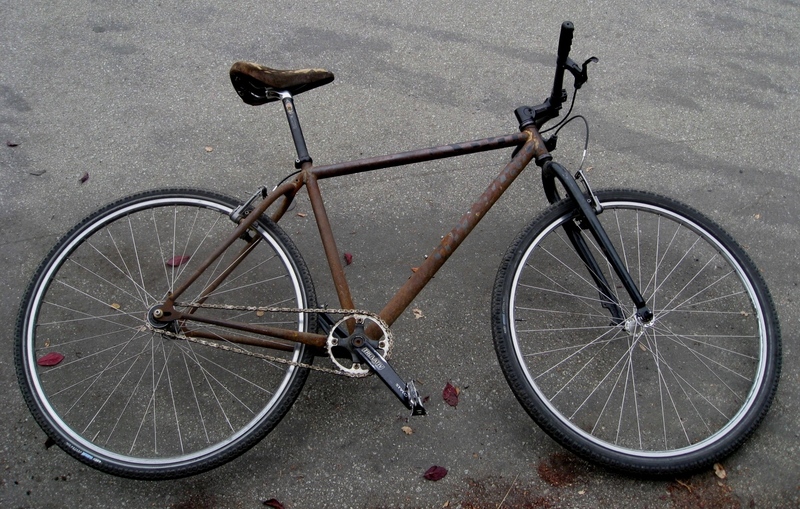 These days it gets ridden around town and lives outside, about 1/4 mile from the Pacific Ocean, in a notoriously foggy town and has earned the name Trusty Rusty. It gets lighter every day. Good thing I used those heavy tubes. I originally started building bikes because I had worked in a bike shop seemingly forever and wanted a new challenge. Also, living on bike shop wages prevented me from owning a lot of the bikes I worked on for others. Building seemed like the next logical step. My girlfriend had a better job than I and owned a couple of really sweet fillet brazed bikes by Albert Eisentraut and Curtis Inglis. My enthusiasm for it couldn’t be contained so I just went for it, asking advice when I had to, but mostly just bumbled around in my little shop for hours trying to figure it all out. The idea of making a sweet bike on the cheap turned out to be a pipe dream, spending more on simple tools than it would have taken for a first class handmade frame. Oh well. The “career” came pretty slowly. I didn’t want to force it and end up somewhere (or nowhere) I didn’t want to be. I worked several years for a couple builders doing a lot of grunt work in exchange for using tools while gaining knowledge and experience. Meanwhile, the day job stayed around for a long time. It went from a full-time day job, to a part-time day job, to an occasional day job. Quitting that gig only came about as it became painfully obvious that it was getting in the way of me making a living building bikes. I’m glad it played out as it did. It really just stems from an addiction to the learning associated with all the steps and tasks in building my own bikes. If things had ended up differently and I wasn’t building bikes, I may have pursued my interest in old motorcycles. I’ve had a bunch and currently own a couple awaiting restoration. There will always be old motorcycles to tinker with. 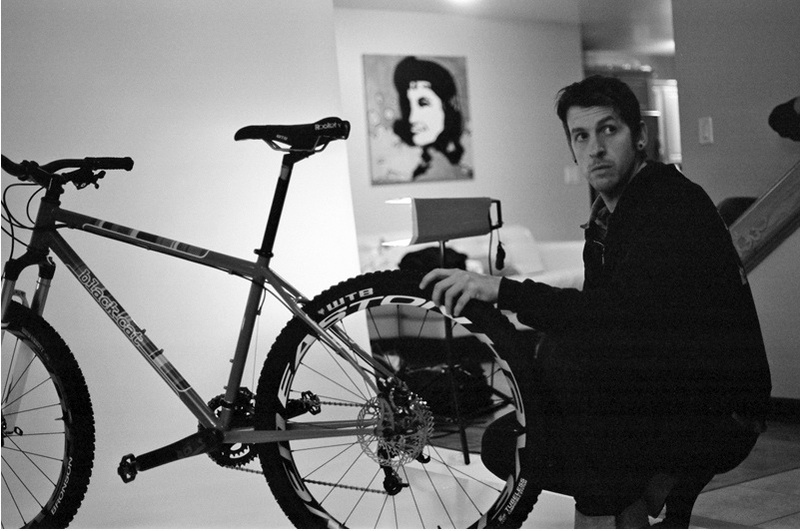 This entry was posted in Frame Builders, Mountain Biking, My First Bike and tagged black cat bicyles, brian vernor, california frame builders, john cutter, mountain biking, santa cruz, todd ingermanson. Bookmark the permalink.